If you ever wanted a real taste of the history of Mexico, this is your chance! Discover Mexico is the perfect setting for this experience. After a guided tour of the amazing miniature museum of Discover Mexico (read more about the tour here), you will have the opportunity to learn about the Mexican art of Tequila. Tequila is the name of a valley in the State of Jalisco where this potent liquor has been made for centuries. Much like a fine single-malt scotch, there are Tequilas of incredible quality that are to be similarly sipped and savored. And the flavors are every bit as subtle and complex. You will sample a Blanco, a Reposado, and an Añejo (aged), as well as a Tequila cream and Tequila liqueur. Even their bottles are often lovely works of art. Delight yourself with a sampling of these excellent and very different Tequilas while being given a detailed tour of the preparation of the most famous drink in México. You will also learn the all-important art of drinking Tequila - no salt or lime needed! 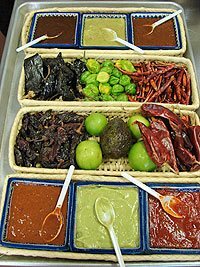 All the while, you'll get to sample tacos and our outstanding salsa bar with six different kinds of salsas. Take a Guided Tour through Mexico's History! Walk Through Authentic Art in the Art Gallery! Learn About the Making and Art of Tequila! Sample Different Varieties of Tequila - So Tasty! Discover the "Right Way" to Drink Tequila! Enjoy Fresh Tacos and Our Special Salsa Sampler! Cruise Passengers: This tour is available to all cruise passengers except those on Carnival ships. When: Park hours are Monday through Saturday from 8:00 AM to 4:00 PM. You can come anytime during those hours, but guided tours run at 10:00 AM & 1:00 PM. Groups of 5 or more can have a guided tour at any time. Where: Meet at Discover Mexico Park, walking distance from the Puerta Maya Cruise Pier. How Long: 3 Hours Approximately. After the tour, you still should have plenty of time to head to one of Cozumel's beach clubs and relax and snorkel, or go shopping in town for the rest of the day. This is not just your average tequila tour. Instead of just one variety of tequila being pitched to you to buy, this seminar will teach you about the different types and brands of tequila, even expose you to the different bottling techniques, and you will not be actively sold tequila during this activity. Of course, there is a gift shop at Discover Mexico where you can buy your favorite kind if you want to, but it's not being pushed on you like at the standard tequila tours. Kids: All ages welcome. Kids from 0-3 are free. Kids prices apply to ages 4-12 years. If you are on a Carnival Cruise Lines ship, you cannot book this tour. Luckily everyone not on a Carnival ship can book this tour at our great discount price! Also see our Mr. Sancho's Tequila Seminar. Taxis are lined up waiting for you as you get off the ship. Very easy. Should cost only about $9.00 USD from the Punta Langosta Pier to get to the park.